We often go through our daily routines without giving a thought to some of the little things that surround us – like loose change on the ground that seemingly never gets picked up or sliding doors that automatically open and close at stores. But one of those things that we all encounter and walk over constantly are the brightly colored rubbery pockmarked mats that have lately been showing up on curbs all over Red Hook and beyond. Detectable warning surfaces are strips of small, raised, color-contrasting circles on pedestrian ramps. They are required by the Americans with Disabilities Act (ADA) to be installed at transition points where there’s a street crossing and when the right-of-way changes, like from a sidewalk to a roadway. 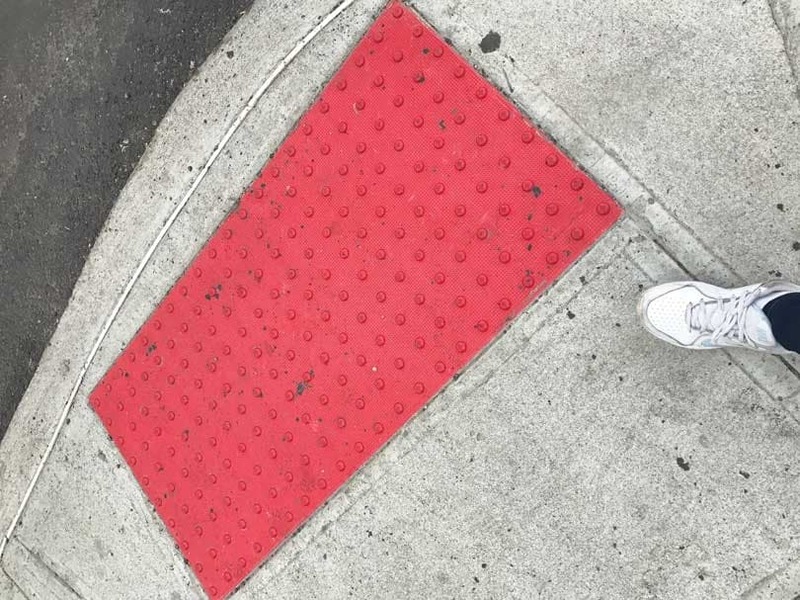 These detectable warning surfaces are intended to alert visually impaired and blind pedestrians to a change in environment and surface conditions, as they walk and cross the street with or without a cane. The ADA, which was signed into law by President George H.W. Bush in 1990, provided fair treatment and new opportunities for millions with disabilities across the United States. As a result, it required state and local governments to meet certain curb cut specifications, including that curb cuts be built wherever pedestrian walkways intersected with a curb. Curb cuts received detectable warnings in the form of truncated domes that could be felt via a cane and with the feet through the soles of most types of shoes. These domes must contrast in color with the surrounding street and sidewalk (either light-on-dark or dark-on-light), which is why we often, for example, see red or dark gray detectable warning strips on light gray-colored sidewalks today. Additionally detectable warnings must be slip-resistant to keep shoe heels and cane/crutch tips from sliding on walking surfaces. However, ADA criteria were revised and released by the U.S. Department of Justice in 2010, including modifications to detectable warning surfaces. The ADA 2010 Standards for Accessible Design expanded on the previously set standards by setting minimum and maximum dimensions for dome size and spacing, according to a May 2012 post by the New Jersey Bicycle and Pedestrian Resource Center. The original standards specified that the truncated domes have a diameter of 0.9 inches and a center-to-center spacing of 2.35 inches. That was changed, with the new design standards setting a base diameter between 0.9 inches and 1.4 inches and spacing between 1.6 inches and 2.4 inches. The height of the truncated domes remained unchanged at 0.2 inches. As a result, these raised truncated domes (in a consistent grid pattern) provide a distinct impression on the bottom of individuals’ feet while walking. Curb cuts must be at least three feet wide, and a 24-inch strip of detectable warnings should be installed across the bottoms of curb ramps, which may have a maximum slope of 8.33 percent. The ADA also stipulates that the curb cut has to be a minimum of two feet from the transition of a pedestrian walkway into a potentially dangerous, vehicular way. The biggest change regarding detectable warning surfaces, however, had to do with where they were required. The 2001 ADA guidelines required detectable warning surfaces on curb ramps, in front of doors to hazardous areas, at dangerous vehicular areas, on transit platforms, and at the edges of reflecting pools. The 2010 revised standards only required detectable warning surfaces on curb ramps in the public right-of-way and on transit platform edges. One of the companies that installs detectable warning surfaces onto curb cuts across the country is ADA Solutions. The Massachusetts-based company has been manufacturing detectable warning products since 2001, and is a leading manufacturer of the products in North America today. According to its official website, ADA Solutions makes cast-in-place surfaces, durable surface applied panels for existing concrete or new construction, radius system warnings for curving surfaces and more. All of its products adhere to the current requirements set by the ADA Accessibility Guidelines and Public Rights-of-Way Accessibility Guidelines. ADA Solutions’ surfaces are made from a reinforced fiberglass, carbon and glass composite for enhanced durability. Brad DeAndrea, senior vice president of international business development at ADA Solutions, said the fiberglass polymer composite is “undoubtedly the most effective” and yields the best results for ‘stop’ ratios, in comparison to brick, rubber and concrete composites. The slip-resistant detectable warning products are also not affected by extreme low or high temperatures, and are not affected by salt, according to lab testings. However, the most important aspect is the “sound on cane” element, which is the sound canes make during a sweeping motion against the products. As per its website, ADA Solutions’ composite material and design features “enhance sound attenuation, making them the best choice for true detectability.” DeAndrea said the material of the detectable warning surface makes a distinct resonating sound when a cane is tapped against it, and that there is a vibrational element as well. One of the primary functions of detectable warnings is to be visual, meaning there is a color contrast between the tactile warning surface and the surrounding concrete surface. DeAndrea said this allows people – including not those who are blind or visually impaired, but also pedestrians who are distracted – to recognize the difference in color as they’re walking along and approaching a curb cut. In terms of colors, ADA Solutions offers the most popular colors used nationwide: yellow, clay-red, brick-red, black, gray and blue. DeAndrea explained that yellow is the universal color for caution and that yellow also appears to be the brightest color in the spectrum. However, he said safety-red is becoming more popular to use for detectable warning surfaces nowadays. Paul Schiloski, a regional account manager at ADA Solutions, said the New York area has a lot of gray detectable warning surfaces because that was New York’s color preference. But he’s found that New York and New Jersey are switching over to the safety-red color instead. While Schiloski said ADA Solutions does thousands of tiles a year in New York, he told this paper it was hard to determine the exact number of tiles and square feet that have been installed in New York City by the company. While the purpose of detectable warnings is intended for the blind and visually impaired, they also help those who are not visually impaired. “The unintended benefits of detectable warnings [are for] visually distracted pedestrians, particularly in urban areas, that are married to their mobile devices,” DeAndrea said. With their contrasting colors and raised truncated domes, the detectable warning surfaces alert those who are scrolling through social media, texting and/or making phone calls that they are about to walk off or walk onto a corner. According to a Governors Highway Safety Association report released in February 2018, the number of pedestrian fatalities from 2007 and 2016 increased 27 percent. The report also stated that nearly 6,000 pedestrians were struck and killed by motor vehicles in 2017. Though reasons for the rise have not been scientifically determined, experts believe the increased use of smartphones could be one of the contributions in the trend. 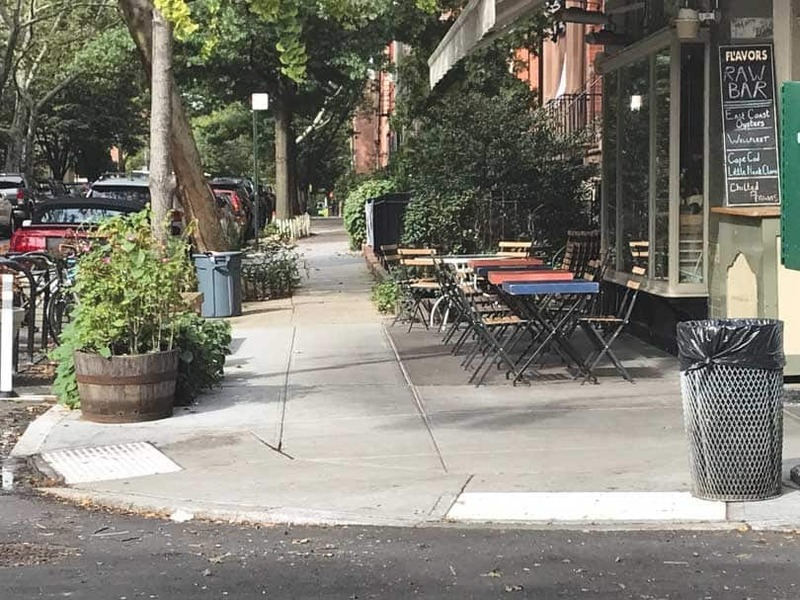 In September 2014, Manhattan Borough President Gale Brewer and her team of volunteers conducted a canvassing project about existing curb cuts’ ADA compliance in Manhattan. More than 40 staff, interns and volunteers were recruited and trained to measure curb cuts along Broadway, from Manhattan’s southern tip at Bowling Green to its northern tip in Inwood. Less than a year later, they found that only 115 measurable curb cuts – out of the 1,209 they had canvassed – were fully compliant with the ADA accessibility standards. Additionally of the same 1,209 curb cuts canvassed, only 154 (11.3 percent) had proper detectable warnings – meaning that 88.7 percent of the curb cuts did not have truncated domes. Ed Plumacher, an adaptive technology specialist for vocational rehabilitation at Lighthouse Guild, has been a sight cane user since 2011. He commutes to the Upper West Side from Long Island everyday, via the Long Island Railroad and MTA subway. Plumacher said he encounters detectable warning surfaces constantly, and emphasized how important they are for him while traveling and walking to and from work. With that being said, one of the issues Plumacher has previously experienced is the lack of consistency regarding slope and orientation. But Plumacher said orientation and slope are not only important for cane users like himself, but for guide dog users as well. “The guide dogs are trained to stop at a curb, so if it’s a wide, gradual slope they may not pick up on it and properly stop at the corner,” he explained. The World Health Organization estimated in October 2018 that 1.3 billion people around the globe live with some form of vision impairment, and that 36 million people of that number are blind. There were almost 40 million listed Americans with a disability in 2015, according to the U.S. Census Bureau. The National Federation of the Blind stated on its website that, of the 40 million, about 7.3 million individuals (age 16 and older) had reported significant vision loss. Approximately 387,900 people in New York reported having a visual disability in 2015, as per the 2015 American Community Survey results that were interpreted by Cornell University’s Employment and Disability Institute. While there are no reliable current stats regarding the use of canes or dog guides, the Guiding Eyes for the Blind estimated that there were 10,000 guide dog teams working in the United States last year. They also cited on their official website that about two-percent of all people who are blind and visually impaired work with guide dogs.